Here the complete list of best top Android Phones under 5000 RS in India or USD $ 100 with best specifications. Many phones in the list are having 4G LTE support as well. All phone in list are either having 1GB or more RAM. 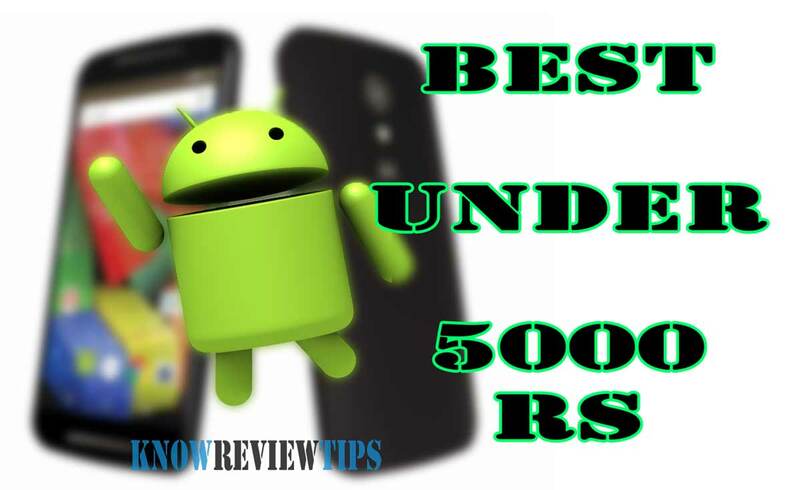 We hope you like our selection on Best Android Smartphones under RS 5000 / 5K. This list is not specifically for India only, but also for those living in United Kingdom, USA, Australia, Philippines, South Africa etc. You can buy these phones from online (Flipkart / snapdeal, Amazon, newegg / walmart ) and offline stores as well depending on your country and state. Phicomm Energy 653 comes with a 5inch 1280 x 720 pixels Capacitive touchscreen screen. It is powered by 1.1 GHZ Quad-core CPU integrated with 1Gigs of RAM. It owns a 8Megapixel primary camera and a 2MP secondary camera. It houses 2300mah battery. The Energy E653 4G comes with 8GB of inbuilt storage . It is a DUAL SIM smartphone with 4G LTE connectivity. You can buy it at INR 4999. YU Yunique YU4711 features a 4.7inch 1280 x 800 pixels IPS display. It draws the strength from 1.2 GHZ Quad-core CPU and 1GB of RAM. It is equipped a 8MP rear cam and a 2 Megapixel front camera for selfies. It has 2000mah battery. The Yunique YU-4711 comes with 8 Gigs of ROM . It is a DUAL SIM smartphone with 4G LTE connectivity. It is priced at RS 4999. Swipe Elite 2 features a 5inch 960 x 540 pixels IPS qHD display. It draws the strength from 1.3 GHZ Quad-core CPU and 1GB of RAM. It is equipped a 8MP rear cam and a 5 Megapixel front camera for selfies. It has 1900mah battery. The Elite-2 comes with 8 Gigs of ROM and is 8.5mm thick. It has 4G LTE support. It is priced at RS 4666. Ringing Bells Smart 101 comes with a 5.0inch 480 x 960 pixels IPS LCD screen. It is powered by 1.3 GHZ Quad-core CPU integrated with 1Gigs of RAM. It owns a 8Megapixel primary camera and a 3.2MP secondary camera. It houses 2800mah battery. The Smart 101 comes with 8GB of onboard storage and is 8mm thick. It is a DUAL SIM smartphone with 4G LTE connectivity. You can buy it at INR 2999. ZTE Blade Qlux 4G comes with a 4.5inch 480 x 854 pixels IPS screen. It is powered by 1.3 GHZ Quad-core CPU integrated with 1Gigs of RAM. It owns a 8Megapixel primary camera and a 5MP secondary camera. It houses 2200mah battery. The Blade Qlux 4G A430 comes with 8GB of inbuilt storage . It is a DUAL SIM smartphone with 4G LTE connectivity. You can buy it at INR 4999. Swipe Konnect 5.1 features a 5inch 480 x 854 pixels IPS display. It draws the strength from 1.3 GHZ Quad-core CPU and 1GB of RAM. It is equipped a 8MP rear cam and a 3.2 Megapixel front camera for selfies. It has 3000mah battery. The Konnect 5.1 comes with 8 Gigs of ROM . It is a DUAL SIM smartphone with 3G connectivity. It is priced at RS 3999. Infocus M2 features a 4.2inch 1280 x 720 pixels LTPS display. It draws the strength from 1.3 GHZ Quad-core CPU and 1GB of RAM. It is equipped a 8MP rear cam and a 8 Megapixel front camera for selfies. It has 2010mah battery. The M2 comes with 8 Gigs of ROM . It is a DUAL SIM smartphone with 3G connectivity. It is priced at RS 4999. XOLO ERA comes with a 5inch 480 x 854 pixels IPS screen. It is powered by 1.2 GHZ Quad-core CPU coupled with 1Gigs of RAM. It owns a 8Megapixel primary camera and a 2MP secondary camera. It houses 2100mah battery. The ERA comes with 8GB of inbuilt storage . It is a DUAL SIM smartphone with 3G connectivity. You can buy it at INR 4444. Karbonn Titanium S200 HD features a 5inch 1280 x 800 pixels TFT LCD display. It draws the strength from 1.2 GHZ Quad-core CPU and 1GB of RAM. It is equipped a 8MP rear cam and a 3.2 Megapixel front camera for selfies. It has 2600mah battery. The Titanium S200 HD comes with 8 Gigs of ROM . It is a DUAL SIM smartphone with 3G connectivity. It is priced at RS 4999. Micromax Bolt Q338 comes with a 5.0inch 720 x 1280 pixels IPS LCD screen. It is powered by 1.3 GHZ Quad-core CPU coupled with 1Gigs of RAM. It owns a 8Megapixel primary camera and a 5MP secondary camera. It houses 2000mah battery. The Bolt Q338 comes with 8GB of onboard storage . It is a DUAL SIM smartphone with 3G connectivity. You can buy it at INR 3199. Huawei Honor BEE features a 4.5inch 480 x 854 pixels TFT Capacitive display. It draws the strength from 1.2 GHZ Quad-core CPU and 1GB of RAM. It is equipped a 8MP rear cam and a 2 Megapixel front camera for selfies. It has 1730mah battery. The Y541-U02 Honor BEE comes with 8 Gigs of ROM . It is a DUAL SIM smartphone with 3G connectivity. It is priced at RS 4999. XOLO ONE HD comes with a 5inch 720 x 1280 pixels IPS LCD screen. It is powered by 1.3 GHZ Quad-core CPU coupled with 1Gigs of RAM. It owns a 8Megapixel primary camera and a 5MP secondary camera. It houses 2300mah battery. The ONE HD comes with 8GB of onboard storage and is 9.5 mm thick. It is a DUAL SIM smartphone with 3G connectivity. You can buy it at INR 4777. Micromax Canvas Spark Q380 features a 4.7inch 540 x 960 pixels IPS display. It draws the strength from 1.3 GHZ Quad-core CPU and 1GB of RAM. It is equipped a 8MP rear cam and a 2 Megapixel front camera for selfies. It has 2000mah battery. The Q380 comes with 8 Gigs of ROM . It is a DUAL SIM smartphone with 3G connectivity. It is priced at RS 4999. Intex Aqua N comes with a 4.0inch 480 x 800 pixels IPS screen. It is powered by 1.2 GHZ Quad-core CPU integrated with 1Gigs of RAM. It owns a 8Megapixel primary camera and a 2MP secondary camera. It houses 1400mah battery. The Cloud N comes with 8GB of inbuilt storage . It is a DUAL SIM smartphone with 3G connectivity. You can buy it at INR 4199. Reach Hexa 551 features a 5.5inch 1280 x 720 pixels LCD display. It draws the strength from 1.3 GHZ Quad-core CPU and 1GB of RAM. It is equipped a 8MP rear cam and a 3.2 Megapixel front camera for selfies. It has 2600mah battery. The Hexa551 comes with 8 Gigs of ROM . It is a DUAL SIM smartphone with 3G connectivity. It is priced at RS 4444.